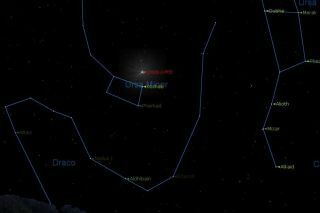 The Ursid meteor shower will peak the night of Dec. 22-Dec 23, but a bright moon may wash out the unlucky display. The Ursids, December's "other" meteor shower besides the famous Gemenids, will peak in late December — but will face stiff competition from the dazzling winter moon. December is an interesting month for meteor showers. Over the entire, year, there are 10 meteor showers considered the "principal" displays. In order to break into the "Top 10," a particular meteor shower must produce at least 10 meteors per hour at maximum. Of course, there is the Geminid shower, which over the years has evolved into the most prolific and reliable of all the annual meteor displays. And then, there is the "other" December shower, which , in stark contrast, hardly gets noticed at all: the December Ursids. This year, the peak of this meteor display is due during the late night hours of Tuesday, Dec. 22, into the early morning of Wednesday, Dec. 23. The Ursids are so named because they appear to fan out from the vicinity of the bright orange star Kochab, in the constellation of Ursa Minor, the Little Bear. Kochab is the brighter of the two outer stars in the bowl of the Little Dipper (the other being Pherkad), that seem to march in a circle like sentries around Polaris, the North Star. These meteors are sometimes called the Umids to distinguish them from those associated with Ursa Major. Since Kochab is positioned so near the North Pole, it nearly never sets for most viewers in the Northern Hemisphere. And since the Ursids seem to fan out from this region of the sky, you can look for these faint, medium-speed meteors all through the night if you care to. But this year, nearly full moon will almost completely squelch the Ursids. In fact, for the first time in 38 years, the moon will turn full on Christmas Day. With the peak of the Ursids coming just a couple of nights beforehand, these meteors will be in direct competition with essentially a giant celestial floodlight illuminating the sky on the first full night of winter. It is unsurprising that observers have neglected the Ursids, which come from the dusty debris left in the wake of the periodic comet 8P/Tuttle. Everything about them is wintry: They occur around the winter solstice and come from near the celestial North Pole. They produce only a dozen or so meteors per hour, to the Gemenids' 120. Their source comet circles the sun in a 13.6-year orbit and was last seen in early 2008; it is due back in August 2021. Sometimes, the Earth interacts with a particularly narrow and dense stream of comet particles, leading to much more intense Ursid meteor displays. In 1945 and 1986, skywatchers caught dozens of bright meteor outbursts per hour. In 2000, as well as 2006 through 2008, counts reached 30 per hour. But no such interaction is expected this year. So, if you will excuse the pun, viewing conditions for the Ursids in 2015 are "un-BEARable!"